Rebuild strength to ride after time off. Riding is a sport that requires a certain level of fitness for success and safety. The more effort you put in to your fitness as a rider, the better your chances for a fun, safe and comfortable ride. If you’ve taken a break from riding and are ready to return to the sport, it’s important to know your general level of fitness. 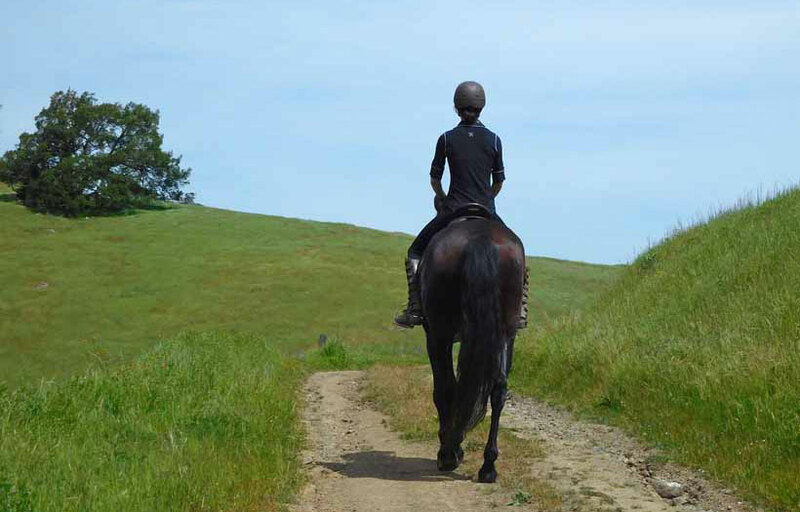 Are you coming back to riding after an injury or illness? Are you returning from a period of general inactivity? Or are you coming back to the saddle with a good level of fitness from participation in other sports and activities? 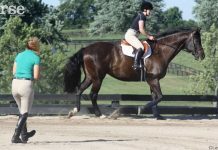 Awareness of your starting point will help you be realistic as you commit to a regular program to prepare for saddle time. After injury: If you are recovering from an injury, make sure you are cleared by your doctor to return to riding and complete any physical therapy entirely. Adapt these exercises as you gain strength and stability. Start with fewer repetitions and build up. As always, if in doubt, work with a trainer, even if it’s just a few sessions to get started with proper form. Starting from scratch: For those starting back with a low level of fitness, be sure to establish some basic cardio and aerobic fitness. Adding walking to your daily routine is an easy, low-stress way to start your efforts. Increase your speed and distance gradually. 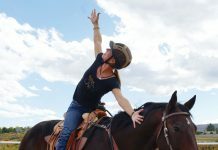 Core strength: Once your fitness base is started, you are ready to add some simple exercises that target riding strength, stability, mobility, and balance. We often hear the term “core strength” and think of abdominal work. However, in addition to the abdominals, the core includes the hips, back and shoulders. 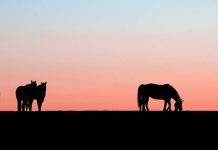 When we talk about strength for equestrians, we are not talking about strength to push the horse around; we are referring to the strength to control your body, to be stable, to use aids independently, and to recover your balance quickly. Don’t skip the warm-up: Start every workout with an active warmup. The purpose of your warmup is to get your heart rate up and to get more blood flow to your muscles; an active warmup phase is the best way to reach these goals. You get out of a workout what you put into it, so use your full range of motion and stick with an invigorating pace. Each workout should include some core strength and stability exercises, hip and shoulder strengthening, range of motion work, simple balance exercises, and a little stretching, mostly for the hip flexors. Are you ready to get started? Try this simple routine that includes these elements to help rebuild your fitness for riding. If an exercise is difficult, stick with it, even if you can only do one repetition at the beginning; add more reps as you build your strength and stamina. Start off with an active warmup of one minute of high-knee marching. Standing tall with your feet hip-width apart, your arms at your sides and your elbows bent, start marching with your arms swinging by your sides. Keep your core engaged and stable. Facing a wall or counter top, hold your hands at about hip width to help stay balanced. Standing on one leg with a soft bend in your knee, swing the opposite leg like a pendulum back and forth. Keep your hips relaxed and fairly square to the wall. Do 10 swings on each leg. With so many shoulder injuries from accidents or overuse, keeping your shoulders mobile with simple range of motion movements is key to preventing injury. Standing with your back to a wall and shoulder blades flat against the wall, extend your arms at shoulder height. Bend your elbows with forearms facing upwards, keeping your arms touching the wall. Straighten your arms directly up overhead, maintaining contact with the wall. Return to the starting position. With your upper arms at shoulder height, drop your forearms downward. Then extend your arms down by your sides, keeping your arms touching the wall. Return through the rotation 10 times. Planks are a simple, old-school exercise with good value. Start with your elbows underneath your shoulders and up on your toes, engaging your core and keeping your shoulders, hips and heels in a straight line. Keep your head in alignment with your spine. Hold the position for a minute, using a timer or counting. Increase your time as you gain strength. Take a break to your knees and then return to the plank position for another minute. Holding the plank position, raise one leg, keeping the spine and hips in alignment. Build up to 10 leg lifts with each leg. Next, take the side plank position on one elbow and foot, bringing your torso into alignment with shoulders over your elbow. Keeping your hips up and aligned, raise the upper leg slowly and lower it back down five times on each side. If this is too difficult, you can lie on your side with your lower arm extended for stability, keeping your hips and shoulders in alignment, raising and lowering your leg. Repeat on each side. The bridge position is a common exercise for those in physical therapy. It’s a good starting point for many exercises or a useful position on its own. Lying on your back with your knees bent and your shoulders flat, raise your hips as high as you can until they are lined up between your shoulders and knees. Slowly lower hips and raise them again for a count of 10. Starting in the bridge position with your hips up, raise each knee in an alternating marching motion. Keep your hips pressed high and stable. Your arms stay on the ground next to your body. If you are feeling strong, repeat both sets of bridge work two or three times. Begin in a seated position with bent knees and your upper body off the floor. Keeping your abs engaged and back stable, punch across as far as you can reach to the outside of your legs. Then twist and punch to the other side. Punch 10 times to each side. The hip flexors are a problem area of many riders; they can get extremely tight and restrict your riding. Stretching your hip flexors allows your hips to open for a more relaxed and supple seat. Start on the floor on your stomach. Put your hands under your shoulders and press up, bringing your right leg forward and slightly across in front of your extended left leg. Push your hips forward, keeping them square, until you feel a gentle stretch in the hip flexors. Then return to your starting position and bring your left leg forward and slightly across to stretch the left hip flexors. Take your time. Special thanks to Reilly Medema and Victory Stables in Elizabeth, Colo.
Debbie Rodriguez is an International Sports Sciences Association certified personal fitness coach, Grand Prix dressage rider and USDF Gold Medalist, USEF ‘S’ Dressage Judge and ‘r’ Eventing Judge, and creator of Success in the Saddle rider fitness DVDs.